Do you use a body pillow? I can't sleep without one. I used to be able to, but over the years my joints have started to require that extra support as I snooze. While my wife fortunately doesn't mind me cuddling something else all night long, I am miffed at the lack of options when it comes to shopping for a body pillow cover. Because of this, I've always made my own. Usually I just make them from an old sheet, but decided to make a fancier one for this newest body pillow I bought (body pillows are on back-to-school sale right now, just FYI!). If you can sew a straight line on a sewing machine, then you can make a body pillow cover of your own. If you're ever looking to change up a room in a way that doesn't cost a lot of money and doesn't require a lot of commitment, then pillows are certainly the way to go. They're interchangeable, they immediately add something to the room (whether it's color, texture, or both), and they're snuggly. So what's not to love? We're looking back at some of our own favorite pillow projects from the archives; because while store-bought is fine, it doesn't require a lot of effort or previous experience to create a one-of-a-kind cushy masterpiece. Now, on with the pillow talk! Your bed is probably what you look forward to coming home to at the end of a long day, or it's what you don't want to leave in the early morning. If you think your bedroom is comfortable now, just wait until you give it an upgrade with these 12 ways to make your bed more comfortable with small changes like pillows, mattress pads, comforters and more. All your home needs is a little love to make it feel like a whole new space, and with any luck, you'll be even more excited to go to sleep every night! As the warm weather continues to emerge, I'm looking forward to spending more time outdoors and enjoying our front porch. Last summer, we purchased inexpensive metal chairs, but since metal is not very comfortable to sit on, I finally got around to making a set of leave printed chair cushions. The best part is you can sew outdoor chair cushions in 30 minutes or less with a few specific materials and this envelope style pillow case. I’m a pillow hoarder. If you find me scouring the pillow section, get me out of there! Nonetheless, I still manage to bring home new pillows and this time I updated a plain pillowcase from IKEA to create this fun DIY geometric gold glitter pillow with random triangle patterns. Independence Day is this week! By now you've stocked up on all your legal fireworks and have your favorite potato salad recipe ready to go. But, if you're looking to bring a little of the red, white, and blue into your decor, we've got a simple sewing project for you! How To: Turn Button-Up Shirts into Throw Pillows! When one thinks of a bedroom, it is safe to guess the first thing that comes to mind is the bed. It is only fair that the all-important bed gets some love and attention now and again with the addition of a good throw pillow or two- and we all like a good DIY, right? How To: Make a Typographic DIY Stencil Pillow! 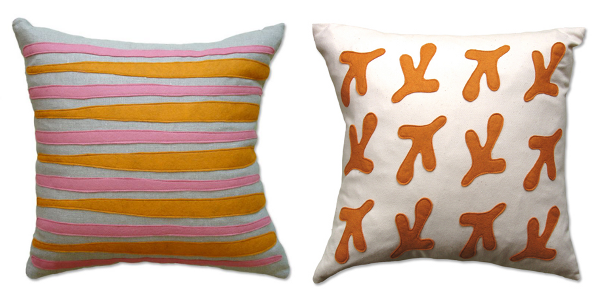 Stencils, linen, and a good quote might be the ultimate throw pillow trifecta! Make It: Easy 5 Minute Pillows! Curbliers, I promise, these are the easiest pillows you'll ever make! I mean, you've got five minutes, right? Let's do this! How To: Screen Print with Masking Tape! Whether you're in a full-blown chevron frenzy (who isn't??!) or just eager to try your hand at making your own Halloween-inspired printed pillows, we've got the tutorial for you! Make It: Colorful Painted Chair Cushions! After honing your painting skills fixing all those thrift store paintings, you should be more than ready to take on this project! Learn how to turn plain canvas seat cushions into functional works of art--for cheap! From Lumpy to Fabulous: A Bed Pillow Makeover and How-to! We all have them: old lumpy pillows that have seen better days but, for whatever reason, we can't bring ourselves to get rid of. They hide in chests or closets "just in case", waiting for an unsuspecting overnight guest or even, perhaps, the perfect DIY project. If you have a few of these forgotten pillows, we have the solution for transforming them into something better! Read on! Knitted poufs have been huge, huge, huge lately and while I fully embrace the trend, I don't really care for the accompanying price tags. From Christien Meindertsma's $2400 Urchin Poufs to Ferm Living's $268 knitted floor pillows, they seem a little more than steep. If you've got the skills - or a grandma who loves you dearly - you can make your own for a fraction of the cost! It's no lie: I love me a good pillow. But modern pillows tend to be on the pricey side and I definitely don't love that. When faced with this dilemma, I say bust out your sewing machine and get creative. Making something ruffled has been on my back burner for months. It's not difficult, but takes a little time to calculate and stitch ruffles onto a base fabric. Over on Knock Off Decor, there's an Urban Outfitters inspired ruffled pillow made out of an old t-shirt and a drop cloth. Oooooh, I love that creative reuse! What's not to love about this deerhead pillow? There are so many things I adore about this project, where do I begin? Here are the top four. 1) The Anthropologie inspiration pillow costs $88.00, a bit steep for a holiday throw pillow, so you're saving about $78.00 by making it yourself. Most asked question: Where do you find your fabric? Answer: Wherever I can find a deal on unusual, high end fabric yardage. How (and why) you should wash your pillows. Washing your pillows every 3 months. Encasing pillows in pillow covers. Replacing old pillows every 3 years.